Welcome to El Loco Tapasbar, a casual restaurant in Hanoi with views to West Lake. You will feel like in Spain in an authentic and unique atmosphere. Entrance fee includes a welcome drink (1 sangria glass, 1 Saigon beer or 1 soft drink), plus during the event you will be able to taste at least 3 of the most traditional tapas in finger food versions. There will also be a special sangria promotion, the glass of sangria will be only 50,000 VND instead of 80,000 VND (regular price). There are 3 lucky draw prizes of 300,000 VND each voucher for 3 winners, to spend at the restaurant. All food is made by Spanish chefs respecting both quality and tradition. You can find tapas representing different areas of Spain with a wide variety of meat, seafood, vegetarian and vegan tapas. You can also enjoy a long selection of Spanish wines and the famous sangria. 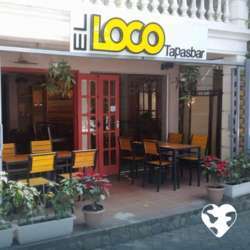 We look forward to greeting you all in the El Loco Tapasbar and helping the InterNations Community with their growth in Hanoi. Thanks! Register now, come, and enjoy! *Note: Last order for foods at 22:00 and for drinks at 22:30, the restaurant is closed at 23:00.